Unwinding, relaxing, and resting is how I have spent my past two days. In the midst of a hectic school year, suddenly all activity came to screeching halt. If you have been watching the news, or the weather to be more exact, you know that there has been a massive winter storm pounding northern states. In fact, the town of Negaunee where I live, in the Upper Peninsula of Michigan, received over three feet of snow. 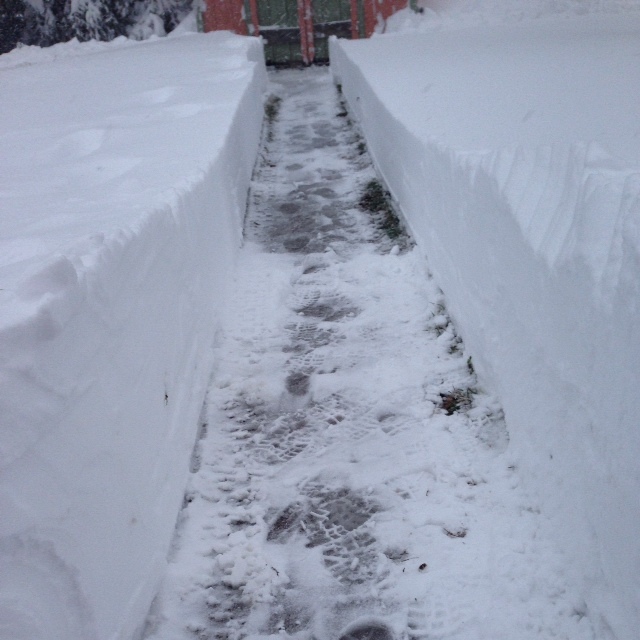 Yes, you read that correctly – THREE feet of snow and I have photos to prove it. My husband, Mike, who is an Operation Iraqi Freedom Veteran — spent his Veterans Day removing snow from our yard. The snow was wet and heavy and I appreciate all of his labor. Today we woke up to several more inches of snow and he again had to dedicate the afternoon to snow removal. On the news they are reporting that lake effect snow will continue. Thank you, Lake Superior. 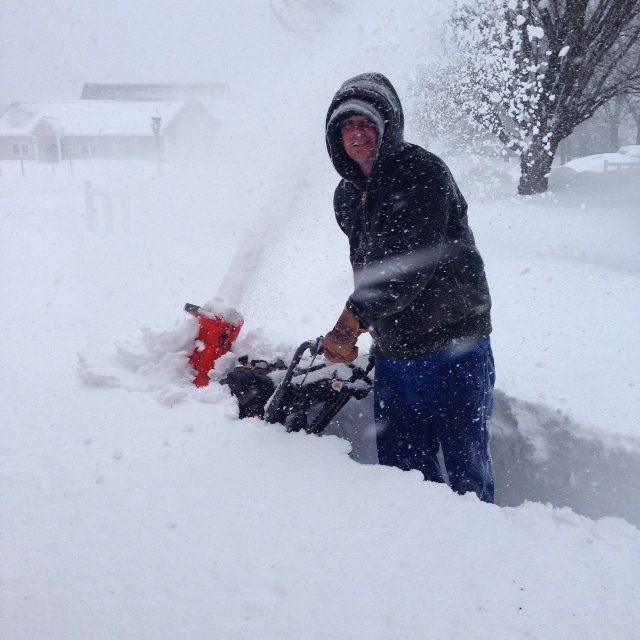 Mike – still smiling even though the snow is reaching beyond the snow blower. Mike carved a path leading to our backyard. A couple of weeks ago we decided to leave the bird baths in our yard up since the birds were still frolicking around and using their basins to drink and bathe. 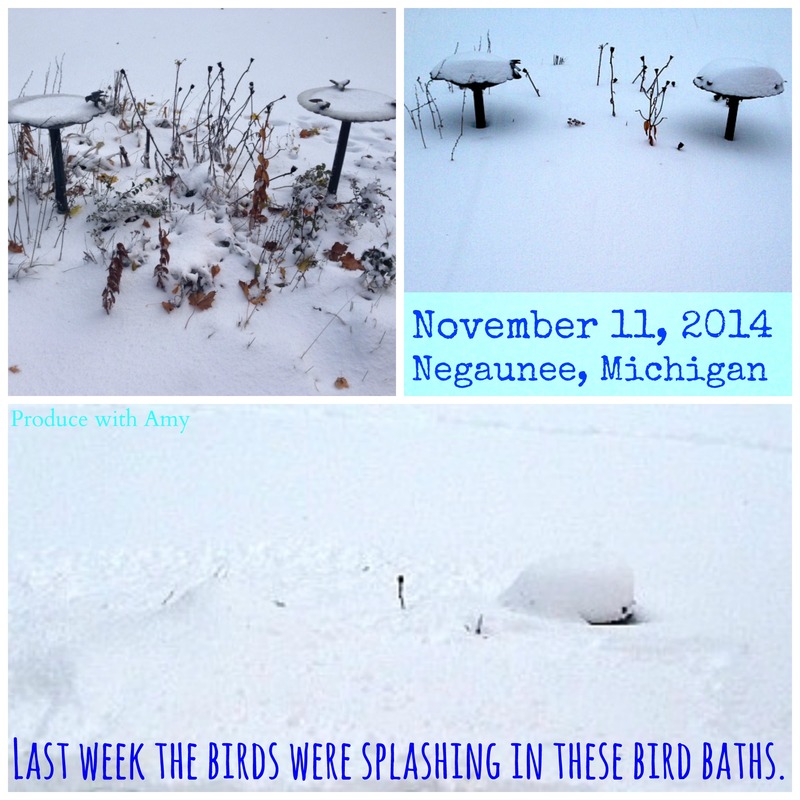 Now the same bird baths have been swallowed up by the snow. Yes the bottom picture is of the same bird baths in the top of the photo. 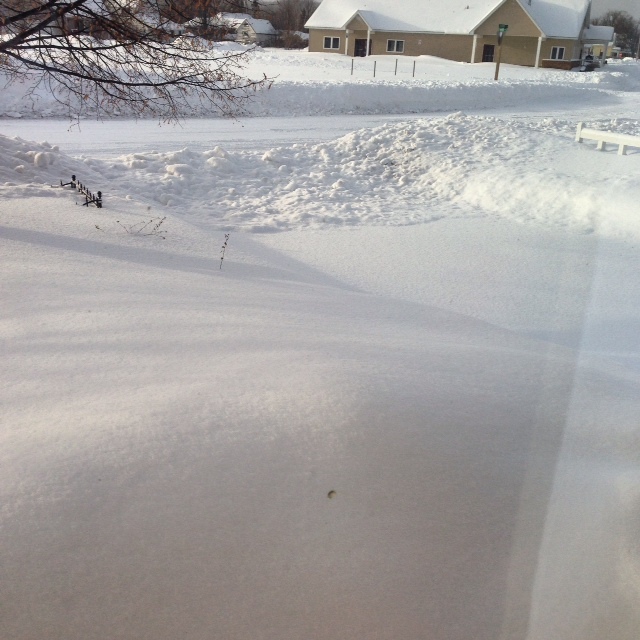 This was our driveway this morning with fresh snow piled up. Today’s snow day gives me the perfect opportunity to share one of the recipes that I have been enjoying for the last couple weeks. 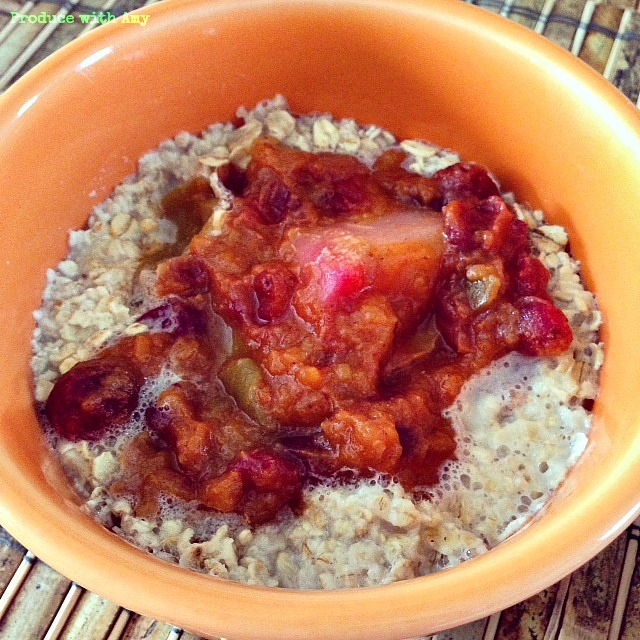 When I started Weight Watchers in 2006, I ate a bowl of oatmeal every morning for breakfast. While I know that oatmeal is filling and carries many health benefits, I burnt myself out of oatmeal and for several years have only eaten oatmeal on occasion. As the weather has grown more cool, I decided that I would try to revisit oatmeal for breakfast and I decided that a rustic apple sauce topping would help me look forward to eating oatmeal again. It has done the trick. The recipe that I am sharing today is versatile and you can add your favorite fruit – fresh or frozen – or whatever you have on hand. I do not have a strong sweet tooth so this recipe tend to be on the tart side. You could add brown sugar or a drizzle of maple syrup if you prefer it sweeter. It would also make a phenomenal topping for ice cream, or if you are dairy free, a topping for “nice” cream. 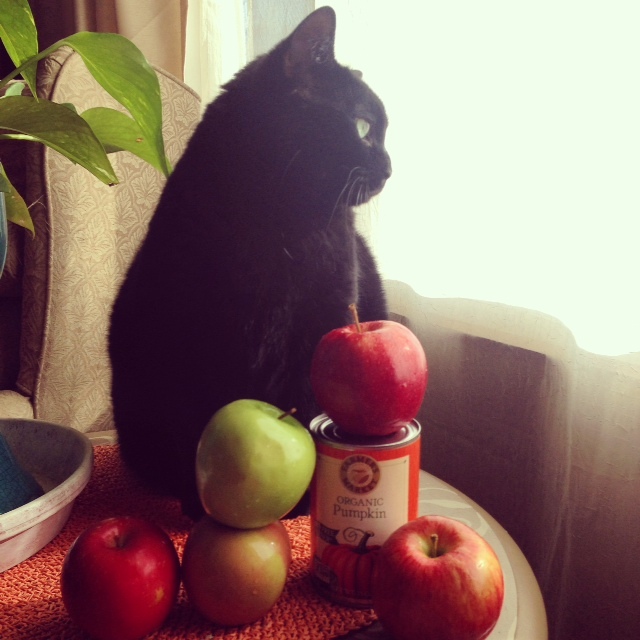 Our cat Pandora is a lovely photo-bomber. 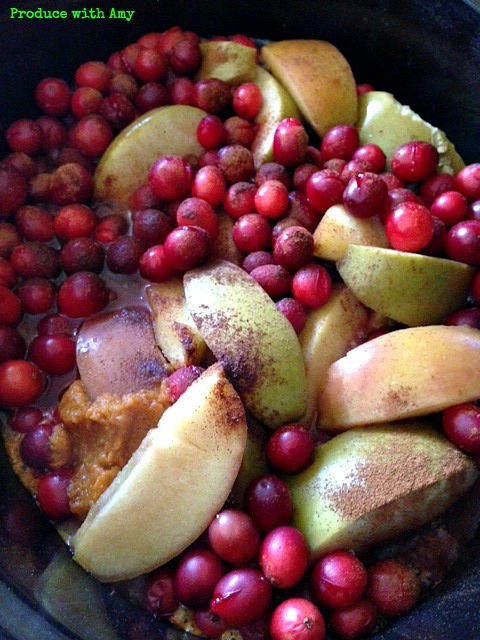 Add all ingredients, except for the pears and peaches, to slow cooker. Set to low for 5 and 1/2 hours. 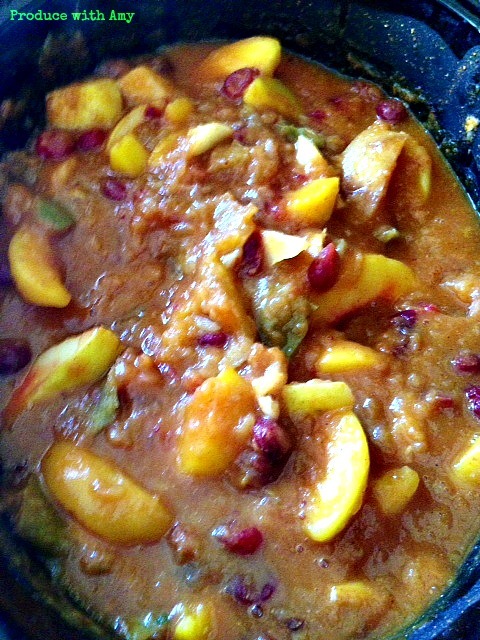 In the last 1/2 hour add the pears and peaches so they retain their shape and are not reduced to sauce. This recipe freezes well. Sorry for the blurry photo. I snapped it when it was hot and steaming. 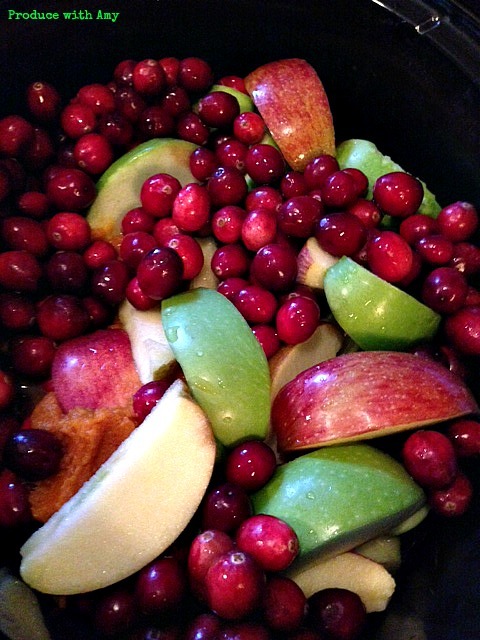 This fruit sauce is simple to make and I love that it does not require any sweeteners. Not to mention the added benefit of making your house smell incredible. It is the perfect healthy comfort food and does not need to only be consumed for breakfast. At night if you crave something sweet it is the perfect snack on its own. If I have the taste for something a bit sweeter, this sauce is wonderful warmed up and topped with a few raisins or a drizzle of local maple syrup. I imagine it would also be lovely served over pancakes, waffles, or French toast. I might have to whip up a batch of pancakes this weekend for Mike – he did after all earn something special with all his work removing the snow in our yard. Thank you for stopping by my blog and I encourage you to sign up for email updates and stop by my Facebook page and give it a like. Make sure you check out all my social networking links on the right side of the page. I look forward to sharing more healthy and plant-based recipes with you. 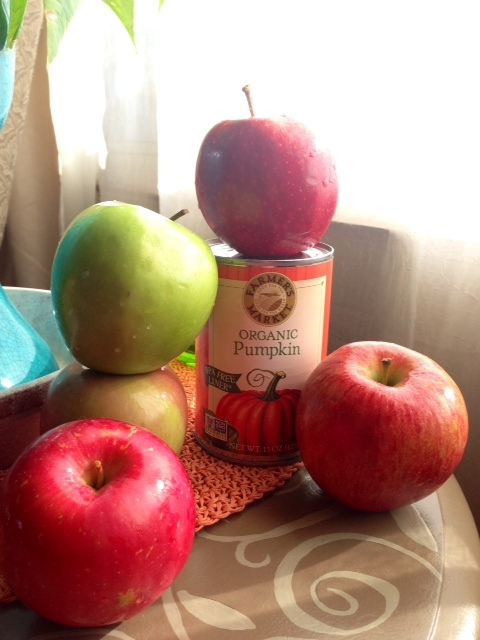 Together we can incorporate more fruit and vegetables into our meal plan. Stay warm and safe to my friends in cold climates. For those that life in sunny locations, please send some sunshine our way! 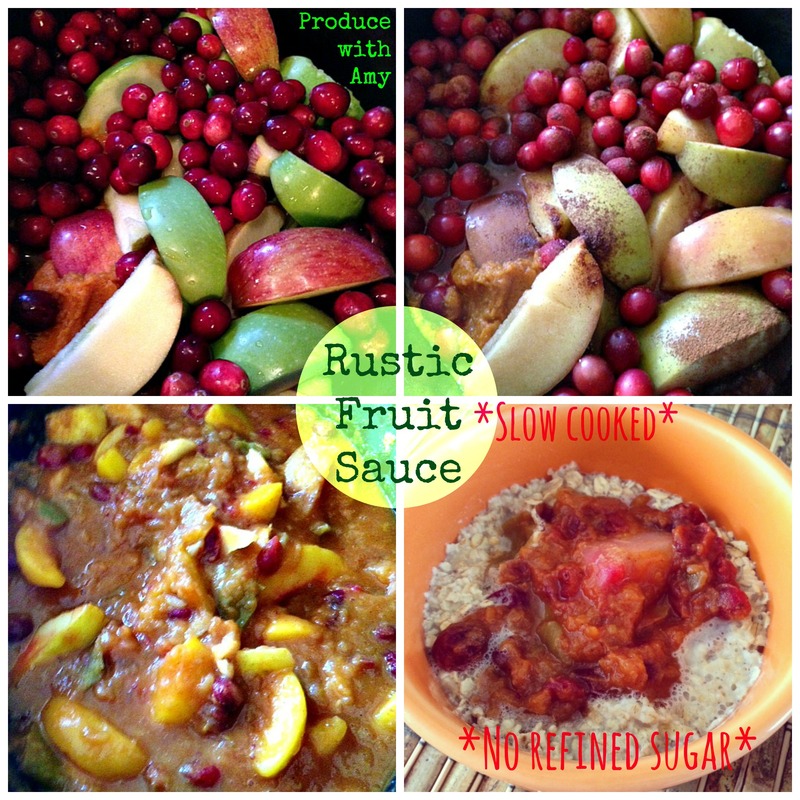 This entry was posted in Breakfast, Dessert and tagged breakfast, fruit sauce, ice cream topping, oatmeal, plant based breakfast, plant based recipe, slow cooker meals, Upper Peninsula of Michigan, vegan breakfast by Amy. Bookmark the permalink. Oh my, Amy! What a way to spend his Veteran’s Day! 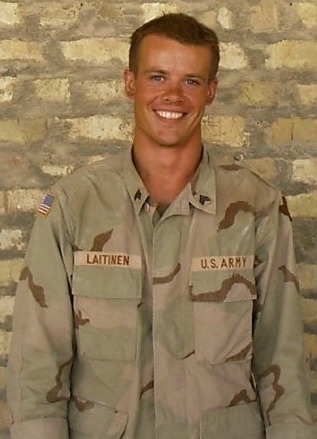 Give him a hug from a British army brat, lol, with many thanks and to you for your delicious recipes! Gillie further south in Kalamazoo! Gillie, thank you so much for your kind words. I passed them on to Mike along with a hug. 🙂 I am so happy that you are enjoying my recipes. I love Kalamazoo – what a beautiful city! Stay warm and I hope that you have a mild winter. They are calling for up to another foot of snow this week and wind chills dipping to -15 below. It’s a good thing that my husband and I live frugally. We are putting as much money away as possible to retire where it is warmer.